2P START! Live! : Heroic Edition | 2P START! 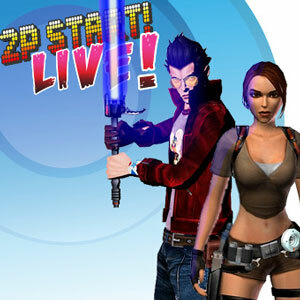 Ray discusses No More Heroes and Tim tackles heroine Lara Croft as the 2P START! Live! podcast returns after observing MLK day last week. Tune in for all the usual segments like Trivia For You, Comic Talk, Suggestion Box, and the Black Doom Award! Congrats on winning, Lwelyk! Also, it’s pronounced “luh-well-ick”. I think the chime is from Sonic 2, not sure, just sort of sounds like it. I always thought that Ray was the slightly gay sounding one (who claims to have a girlfriend but, “you don’t know her” and “she’s in another country”) with the flipped up hair who says “He’s Tim!” the funny one and Tim was the serious one, but this time Tim was really cracking me up. I’m a LOST fan AND a Cloverfield fan, But I don’t think I have the system that that Killer 7 is for. Just listened to the rest of the podcasts. You know that the contest page lists episodes 5 and 6 as 6 and 7. There was no trivia for you in episode 7. P.S. I don’t know what happened up above, comment of the week went to my head. I take back everything I said and strikethroughed about Ray. I wouldn’t worry about it. I actually got a good chuckle out of what you wrote. Good, cause I’m gonna make fun of Tim next week. when I heard tim was “tackling” lara croft I starting thinking about whether his wife new or not. the jingle is the “continue?” screen from sonic2 I believe.